Graham Dunn joined TAP after a long association as a client, and brings more than 20 years’ experience in large multinational organisations, including Nestle, CSC and Aristocrat Leisure, where Graham was Global GM for Human Resources leading a large team of change agents and HR professionals. Since joining TAP, Graham has created case studies and CEO referenceable outcomes with numerous blue-chip organisations including Suncorp, Goodman Fielder, Telstra, Thiess, Macquarie Generation, Super Retail Group and PZ Cussons. Graham’s ability to orchestrate outcomes in complex situations, with a minimum of fuss, has been highly valued by his clients. 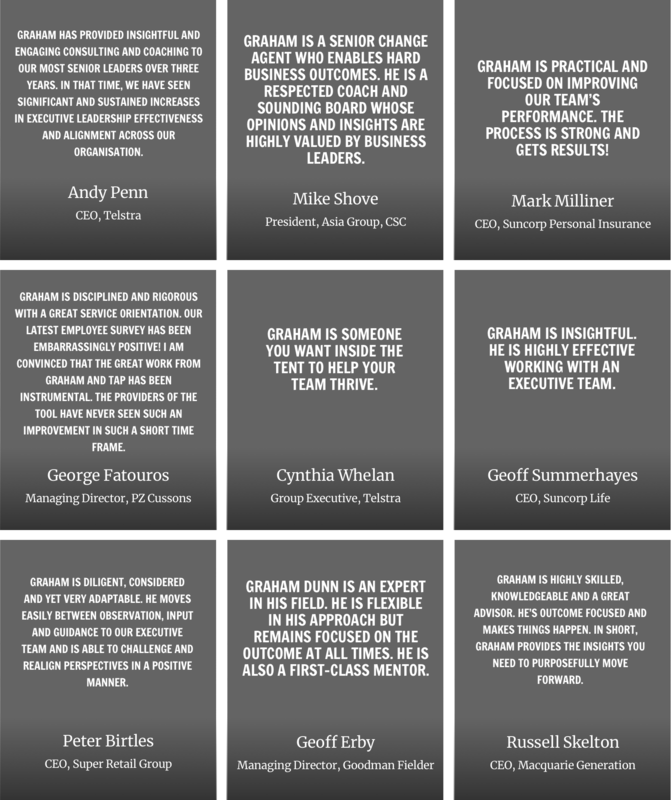 Graham’s expertise spans all elements of business and leadership transformation, with a particular interest in strategy alignment, initiative prioritisation, meeting effectiveness, and the alignment of people and performance systems to organisational goals. Graham is also an experienced business coach with an ability to build strong relationships that contribute to results at a personal, as well as an organisational level. In all of his previous roles, his advice and insights have been highly sought after by senior executives. Prior to joining Aristocrat, Graham held a number of senior positions with CSC where he was critical to the story of business transformation that unfolded there over a period of five years. Prior to CSC, he spent five years working internationally with Nestle in Japan. Graham has a Bachelor of Science from the University of Sydney and post graduate qualifications in Human Resource Management from Charles Sturt University. He holds master accreditation in all Human Synergistics tools, as well as accreditation in Myers Briggs Type Indicator (MBTI).